Confederate monuments are being removed around the country under pressure from those who say they honor a regime that enslaved African-Americans. The pace has increased, however, in the wake of last weekend's deadly confrontation at a white nationalist rally in Charlottesville, Virginia. A statue of U.S. Supreme Court Justice Roger B. Taney, who wrote the 1857 Dred Scott decision that upheld slavery and denied citizenship to African-Americans, was removed from the grounds of the Maryland State House Friday and trucked away to storage. Three of four voting members of the State House Trust voted to move the bronze statue, which was erected in 1872. The city removed a granite fountain Friday that stood in a park as a monument to Confederate soldiers since 1916. One of a few people on hand to oppose the removal was detained when she defied orders to vacate the grounds of the fountain. She was later released. The city near the Canadian border removed signs identifying Pickett Bridge, which was named for Confederate Capt. George E. Pickett. North of Vancouver, former highway markers honoring Confederate President Jefferson Davis were splashed with red or black paint at a park on private land Friday. The Dallas-area theme park Six Flags Over Texas will no longer fly the Confederate flag. The park named for the six flags that have flown over the state said Friday that will now fly six American flags. Transit officials will alter subway tiles at a Manhattan station that have a cross-like design similar to that of the Confederate flag. The design at the 40th Street entrance to the Times Square stop isn't flag-related but transit officials said they want to avoid confusion about their meaning. Earlier this week, plaques honoring Gen. Robert E. Lee were removed from the property of a now-closed Brooklyn church. Meanwhile, Gov. Andrew Cuomo has called on the Army to rename two streets at Fort Hamilton that honor Lee and another Confederate general. A statue of Gen. Robert E. Lee at Duke University was found defaced Thursday. The statue in the entryway to Duke Chapel had damage to its nose. Another monument of a Confederate soldier that stood in front of a government office building in town was pulled down by protesters Monday night. Four people have been arrested, and authorities say more arrests are planned. Earlier, two statues in Wilmington were defaced with spray paint. A statue outside a courthouse dedicated to Confederate soldiers was vandalized. Obscenities and other graffiti were spray-painted on the 1908 monument sometime before dawn Thursday. The damage was repaired. 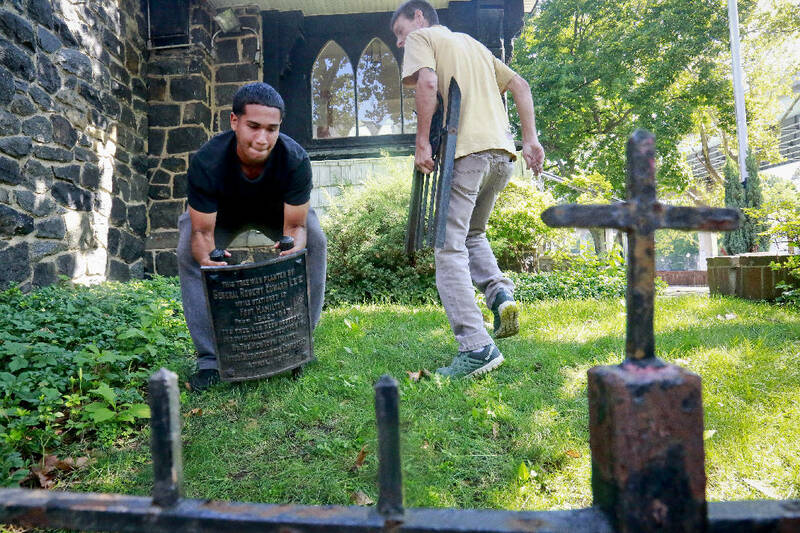 A plaque honoring confederate soldiers was removed Wednesday from a cemetery and a second monument will be taken down later. The plaque lauded "the valiant" Confederate soldiers buried there. Mayor Paul Soglin said the Civil War was "a defense of the deplorable practice of slavery." A Confederate monument outside Phoenix was found covered in tar and feathers on Thursday. Earlier, the Confederate Troops Memorial outside the Arizona Capitol was spray-painted white. It was the second time in a week that the memorial had been vandalized. Four Confederacy-related monuments were hauled away on trucks under cover of darkness late Tuesday night and early Wednesday. Mayor Catherine Pugh said she was concerned that such statues might spark violence. A 1914 monument honoring fallen Confederate soldiers was splattered with paint earlier this week. Opponents are signing a petition to have it removed from a neighborhood near the University of Tennessee campus. A 52-foot-tall obelisk honoring Confederate soldiers and sailors was covered by wooden panels at the mayor's order. The 1905 monument is in a downtown park. The cover-up Tuesday prompted a lawsuit by Alabama's attorney general, who argues that it violates a new law prohibiting the removal of historical structures, including rebel memorials. Hollywood Forever Cemetery, where many movie legends are interred, removed a 6-foot Confederate monument that was erected in 1925. The stone and attached plaque stood near the graves of more than 30 Confederate veterans and their families. The city removed a plaque naming Confederate President Jefferson Davis from a downtown plaza Wednesday. The 1926 plaque honored San Diego as the Western terminus of the Jefferson Davis Highway between Virginia and California.